Recently, Brian provided a lecture to the team at Rice University where Brian was Professor from 1963 to 1968. Click through to read the 33 March 2019 article by Mike Williams - Senior media relations specialist in Rice University's Office of Public Affairs. Click the Image to access the full article. Apollo 17 left the Moon 45 years ago. That dirty space gear has a story to tell. 45 years after NASA astronauts Eugene Cernan and Harrison Schmitt left humanity's final footprints on the Moon, their spacesuits remain visibly grimed with Moon dirt. The folks talking about returning to the Moon would do well to listen to the story these suits have to tell: That dirt proved to be an unexpected challenge in lunar exploration. We stress here that those beliefs were completely valid when applied with the caveat Noel used, for issues relating to the bearing strength of lunar dust. They were valid in the context of the close-up photos by Ranger spacecraft that gave rise to them. Noel's "dismissal" belief was also valid subject to this caveat in consensus of the 1965 IAU-NASA Symposium "The Nature of the Lunar Surface", which concluded that it was safe for humans to land on the Moon of with a surface of fine, powdered dust. However, on September 22, 1966, in his consultant role for Bellcomm, Hinners recommended (Memorandum NASA -CR-153663) relaxing a dust specification in (ALSEP Environmental Specification Revision: Lunar Dust (Bellcomm, Inc). The Abstract of an 8-page report recommends for ALSEP requirements that dust was "less of a potential problem than originally believed." His recommendation was that "vertical and then other non-horizontal surfaces be considered dust free." The Introduction contains the admission that the existing specification for ALSEP "calls for satisfactory operation of the package on the lunar surface even when exterior surfaces and the components are completely covered with lunar surface material or "dust". "As one might suspect, this presents a difficult thermal control problem for certain components (e.g. the passive seismic experiment)." The Memorandum then states "Combined with recent press reports that Surveyor 1 has given no impression of lunar dust, this has led to a desire to re-evaluate the environmental specifications in the hope that it may be relaxed and thus relieve some of the engineering problems." (emphasis not in original). Such a lightly-based reason for a recommendation can be questioned at any time. The reference to Surveyor 1 is evidence of haste. Six Surveyors were dedicated to assist Apollo planning and design. On 17 November, 1967, jet engines of Surveyor 6 were test-fired to lift it a modest few meters which produced irrefutable photos of before-and-after dust effects. One cannot be a Monday-quarter back to judge such decisions under very heavy pressing schedules and collateral decisions depending on successions of such judgements. Nevertheless, making important decisions based on recent press reports from the first Surveyor certainly did nothing within NASA or Bellcomm to counteract the "dismissal" of dust without the 1964 caveat. 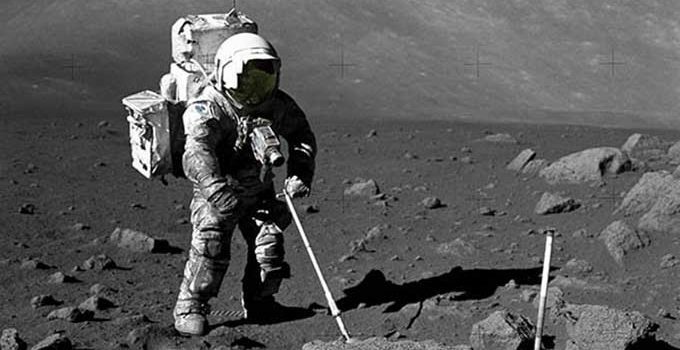 This Website was built in mid-2018 to provide measurement-based information about fine lunar dust and its effects and measurements during the Apollo missions to assist those celebrating the 50th anniversary of the magnificent Apollo 11 achievements. (see ABOUT THIS SITE). In particular, those wanting to write a new book, develop new media or otherwise celebrate, will have great difficulty in finding and being confident about measurement-based truth and historic truth in dealing with Apollo and lunar dust. Parts of official NASA reports and particularly NASA Websites in mid-2018 such as NSSDCA dealing with lunar dust had many errors, omissions, and phrases that do not deserve to be quoted elsewhere or contaminate other sites. Consequently, this website was built with original archival and published records since 1966, and attempts begun since 2006 were intensified to persuade up-dating and corrections if necessary of NSSDCA websites on matters of Apollo and fine dust. To begin, this website necessarily had to focus on criticisms because the majority of dust-related Websites had errors, omissions and other negative failings (see About this site). The server to NSSDCA went down in mid-September 2018, and was begun again on 28 November 2018 as announced here. Welcome to the NASA Space Science Data Coordinated Archive, NASA's archive for space science mission data. We acknowledge that the updated Version 5.0.1 has removed the two invalid former illogical but very influential negative claims we showed for historic record purposes in early September (see here ABOUT THIS SITE). However, with deep regret we show here that updated Version 5.0.1, claiming to provide "space science mission data", fails severely in its coverage of both the high-profile Apollo 11 EASEP spacecraft https://nssdc.gsfc.nasa.gov/nmc/spacecraft/display.action?id=1969-059C and Apollo 11 Dust Detector Experiment (DDE), https://nssdc.gsfc.nasa.gov/nmc/experiment/display.action?id=1969-059C-05 one of two active (measuring and transmitting measurements) experiments of Apollo 11. As shown with case studies below, both updated Version 5.0.1Websites hide data. This double failure despite over two months down-time for servicing is further clear evidence of deep-rooted failures of cultures in managing the websites which have persisted since 2008, with a surge of errors erupting in 2013 which remain unexplained. In 1969 before the launch of Apollo 11 the NASA Apollo 11 Press Kit hid the existence of the Dust Detector Experiment. In 2019, on the 50th Anniversary, the NASA NSSDCA updated Version 5.0.1 Websites hide the dust measurements which explained why the Apollo 11 Passive Seismometer became overheated and was terminated..
WE CALL HERE IN THIS WEBSITE FOR A CHANGE IN CULTURAL ATTITUDES TOWARDS LUNAR DUST IN NSSDCA WEBSITES THAT WILL MAKE THEM CONSISTENT WITH TWO IMPORTANT AND CELEBRATED CHARACTERICS OF NASA: OPEN (TRANSPARENT) REPORTING AND SUCCESS IN SPACE SCIENCE DATA. We strongly recommend to decision makers for relevant NSSDCA Websites that websites relating to Apollo 11, 12, 14 and 15 Dust Detector Experiments (DDEs) be carefully rewritten with a positive not a negative culture. NSSDCA must cast off the present and past culture of avoiding or minimising the importance or even the very mention of dust or its measurement. Lunar dust is a complex but real feature of the lunar surface. All the Apollo astronauts gave testimonies about its reality and significant inescapable effect. Fine dust on the surface of the Moon has many important features that require research and understanding. Thoughtfully designed experiments to explore its features deserve similar or even greater respect as comparable experiments to measure solar wind and radiation on the lunar surface, both of which are problematic. In 2018 NASA began a new Moon to Mars strategy with gloriously successful space science achievements. NASA began 2019 with NASA justifiably celebrating its space science excitements with fly-by photographs of the 9-billion km distant rock. Now, America and the world should be justifiably rejoicing in celebrating the 50th anniversary of both the human and space science achievements of Apollo 11, and then of Apollo 12, 13, 14, 15, 16 and 17. Before discussing the NSSDCA websites updated and put back in service 28 November, 2018, it is necessary to discuss and supply references to a cultural belief in 1964 that became a mindset throughout many in the Apollo era, which became very important to many aspects of Apollo including websites of NSSDCA. Leading consultant engineer Noel Hinners of Bellcomm, forcefully expressed relevant beliefs in his NASA Oral History August, 2010. Noel explained " when the Ranger photos came in, let’s see, that is a big rock sitting calmly on the surface and not sinking out of sight. So thus anybody in his right mind would conclude that the bearing strength of the lunar surface was not an issue. It could hold on to hundreds or thousands of pounds rocks. What’s the problem? Most of us dismissed that concern although Tommy Gold kept at it for a number of years. We did have to deal with him." The problem that arose with Apollo increasingly in the stressful schedules and increasing complexity of many issues is that a culture of "dismissal" of the importance of dust increasingly was believed, or at least accepted, then applied to issues that did not meet the caveat, such as on 12 January 1966 the need for any actual measurement of dust by Apollo 11 ALSEP, after it was required that removable dust covers be placed over apertures of the 3 radiation experiments in the 7 primary experiments selected for ALSPS for all Apollo missions. Such distortions are not uncommon in large organisations where a strongly expressed belief can be widely spread and become popular without articulating any additional words of the essential caveat in the original expression that limited their applicability. With Apollo and dust, dust was already regarded as a nuisance by the geologists, by far the most influential scientists throughout Apollo, because dust blurred clear sight of lunar rocks. The same problem occurred in the first and understandably excited glimpses of sample rocks in the lunar receiving laboratory in Houston. So an attitude of "dismissal" of the importance of dust throughout Apollo and lunar science groups had few champions to resist it becoming popular or at least applied and tolerated. Hapke (1966) had warned that dust would "stick to (an astronaut) and would likely be a nuisance in a number of ways, and I imagine that on the Moon anything which is a nuisance is dangerous." (Hapke, B. W. "Optical Properties of the Moon's Surface", "The Nature of the Lunar Surface", Proceedings of the 1965 IAU-NASA Symposium, p.141-154, ed. Wilmot N. Hess et al., The Johns Hopkins Press, Baltimore, 1966. Hypothetical nuisances to an astronaut did not have high-level importance compared to matters of life or death in the very intense array of everyday decision-making in the creative and active Apollo era. Our present website here was built in part to assist popular understanding about Apollo 11 lunar dust reports during 50th anniversary celebrations (see About this site). Here we use two highest-profile Apollo 11 updated Version 5.0.1 NSSDCA websites of (i) Apollo 11 EASEP, the first observatory ever put by human hands on another celestial body, and (ii) Apollo 11 Dust Detector Experiment (DDE) we invented in January 1966, one of only two active experiments in this pioneering historic mission, and the first experiment to measure movements of lunar dust and its effects. The server to NASA Space Science Data Center (NSSDCA) providing information about Apollo 11 measurements of dust (https://nssdc.gsfc.nasa.gov/nmc/spacecraft/display.action?id=1969-059C) was taken down from mid-September to 28 November 2018. NOTE: See also <https://www.brianjobrien.com/about-this-site/> for our previous comments and past examples of two historic errors. A reasonable person celebrating the 50th anniversary of Apollo 11 and EASEP might wonder how the website can claim that "the EASEP functioned normally" and yet it "exceeded the planned maximum by 30C". We put that aside for the moment to focus on our expectation that this EASEP website updated in November 2018 to provide "space science mission data", should surely provide updated information on the cause or causes of the overheating followed by termination near the hottest part of the second lunar day of the first observatory ever placed by human hands on another world. Who in this age of social communications and STEM would think to leave a cold history for this extraordinarily brave and historic mission to leave as the final words of this Website: "the EASEP no longer accepted commands from Earth stations and the experiment (sic) was terminated". What reader of this most historic website would not ask both How and Why? Certainly those, whether in the USA or internationally, planning a future Moon Village or future expeditions to the Moon or a large airless asteroid would expect nothing less than this EASEP Website to provide as "space science mission data" the answers to How and Why, or dear old Sumner Miller's question "Why is it so?" Even after the server to the website being down for more than 2 months, Version 5.0.1 gives less than nothing for the EASEP spacecraft, having significant omissions. First, NSSDCA states only that EASEP, the historic first geophysical laboratory deployed by human hands on another celestial object, failed . That is history, but not space science mission data. Space science data would be the scientific discoveries by the Apollo 11 Dust Detector Experiment (DDE) of dust contamination during Lunar Module ascent that caused overheating and failure after 21 Earth days of the Apollo 11 Early Apollo Surface Experiments Package (EASEP). Among other important operational information for the Apollo program generally, this space science mission data absent from Version 5.0.1 led to the quick decision to increase the deployment distance for the Apollo 12 ALSEP to 130m from LM instead of the 17m for Apollo 11. 2) O’Brien, B.J., Freden, S.C. and Bates, J.R., 1970, “Degradation of Apollo 11 Deployed Instruments because of Lunar Module Ascent Effects”, Journal of Applied Physics, 41, pages 4538-4541. If the webmaster trusts only NASA, then he could reference the NASA report by Harris which in 1972 made no mention of the Dust Detector report two years previously, or even the very existence of the Dust Detector. This updated Version 5.0.1 for Apollo 11 EASEP inverts the traditional use of references. It omits the two references above which supply space science data information to readers. Remarkably, it does reference the publication NASA reference SP-214 to the unique Apollo 11 EASEP that denies in Chapter 10 the historic event the website reports. Yet it omits two independent published reports that each explain the effect. We now examine whether Version 5.0.1 supplies space science data for the single experiment, Apollo 11 DDE. Again this Version 5.0.1 is inept in its failure to supply space science data. This long website devotes many lines to what one might call the circuitry or technical details of this experiment, and omits the measurements it made as space science data. The final 3 lines of the site informs space scientists of the times when the DDE was on or off. There is no direct mention of overheating or of the cause being dust or of the result being failure after 21 days of the first experimental payload put by humans on another celestial body. In summary there are no space science data such as measurements of dust and the DDE analyses for the experiment whose name is given to the website. It might appear contrary to my discussion that this website does give as a reference the publication by O'Brien et al. (1970). However, I have proof this is not a product of the Version 5.0.1 update in 2018. Instead, 12 years ago I suggested including this reference in my first e-mail to the Webmaster in October 2006. To give the Webmaster credit, it was quickly included and remained so. One could reasonably consider that similar failings by both NSSDCA websites might suggest a common cause, such as a common belief or culture towards lunar dust. In summary, the cultures applied to websites of the Apollo 11 EASEP and Apollo 11 DDE are determined to avoid statements of science data about Apollo 11 and dust. We note several many other errors, omissions, misleading and even bizarre statements throughout the Version 5.0.1 updated suite of NSSDCA Apollo 11, 12, 14 and 15 DDE websites.The culture of dismissal of the importance of fine dust throughout these NNSSDCA websites remains unacceptable by any standards, whether for those seeking truth in layperson's language or in space science data. NSSDCA states only that EASEP, the historic first geophysical laboratory deployed by human hands on another celestial object, failed. That is history, but not space science mission data, the scientific discoveries by the Apollo 11 Dust Detector Experiment (DDE) of dust contamination during Lunar Module ascent that caused overheating and failure after 21 Earth days of the Apollo 11 Early Apollo Surface Experiments Package (EASEP). Among other important operational information for the Apollo program generally, this space science mission data absent from Version 5.0.1 led to the quick decision to increase the deployment distance for the Apollo 12 ALSEP to 130m from LM instead of the 17m for Apollo 11. Widely-read readers can be justifiably confused in this Apollo 11 high ranking, website because it states that EASEP had two experiments, the 47kg Passive Seismometer and the 0.27kg Dust Detector Experiment. NASA states differently in other publications before the launch of Apollo 11. First, in NASA Apollo 11 Press Kit FOR RELEASE: SUNDAY J u l y 6, 1969 RELEASE NO: 69-83K, EASEP, EARLY APOLLO SCIENTIFIC EXPERIMENTS PACKAGE----------Pages 1 45 -1 5 3: QUOTE EASEP consists of two basic experiments: the passive seismic experiments package ( PSEP ) and the laser ranging retro-reflector ( LRRR ). END QUOTE page 145. Second, the Apollo 11 publication EASEP Familiarisation Manual "For Training Purposes Only 15 February 1969 Contract NAS9-5829(SA-65)" was made available before launch by Bendix Aerospace who designed the Apollo 11 EASEP structure and operations. https://www.lpi.usra.edu/lunar/ALSEP/pdf/ALSEP%20%2336%20-%20EASEP%20Fam%20Course%20Handout_021569.pdf. Bendix list two experiments, Passive Seismic Experiment Subsystem in Chapter 8, and Laser Ranging Retro-reflector in Chapter 9. As with the NASA Press Kit, the Bendix familiarisation journal does not mention or show the Apollo 11 Dust Detector Experiment. That contrasts with versions of the ALSEP Familiarisation Manual over the previous two years, where the Dust Detector Experiment was listed and included in working drawings and in negotiations about preferred assignments with telemetry. To assist readers to reconcile the pre-launch Apollo 11 Press Release and Bendix familiarization manual, with the NSSDCA updated Version 5.0.1 website now on the web since 28 November 2018, Apollo 11 EASEP website describing Apollo 11 historic observatory, we point out here that the Passive Seismometer and the unmentioned Dust Detector were the two electrically-powered experiments deployed by Apollo 11, whose measurements were transmitted to Earth for 21 days. The Laser experiment required no power and continued operating for many years. As to whether its long-term performance may have been affected by lunar dust, it survived and was producing important scientific data many years later in conjunction with fellow experiments deployed elsewhere.. The NSSDCA webmaster for the updated Version 5.0.1 gives a very confusing mixture of descriptions of EASEP by sometimes calling it EASEP and sometimes "the instrument" by which is meant the Passive Seismic Experiment (aka Passive Seismometer). We make no attempt here to disentangle this website confusion, in part because the misunderstandings within the relevant webmakers extend their confusions to bizarre misunderstandings of the telemetry for Apollo 14 and 15 dust detector websites. Here we note only that this updated Version 5.0.1 website for this historically important first experimental package by a human on another cosmic body other than Earth gives readers only (i) extensive confusion between "instrument" and "EASEP" and (ii) information that the instrument or EASEP was "terminated". No reason is given in this website. No cause of overheating is given. 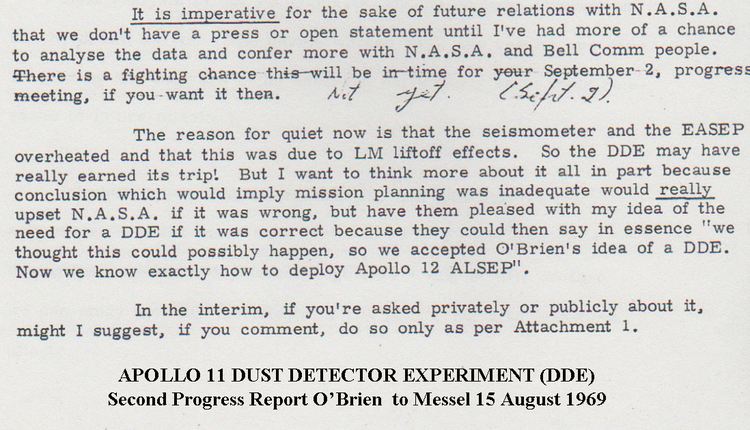 In summary, official public Apollo 11 documents hid the existence of the Dust Detector Experiment (DDE) before launch. The experiment was omitted from NASA Apollo 11 Press Kit. To the credit of NSSDCA, Version 5.0.1 does not hide the existence of the Dust Detector Experiment on Apollo 11 EASEP. However, NSSDCA Version 5.0.1 does hide the space science data from the Apollo 11 DDE and therefore hides the explanation of the termination the DDE data, which answered the How? and Why? EASEP was terminated. More, it added confusion by its choices of references. It hides the data for both the senior website for EASEP spacecraft and the detailed website for the individual Dust Detector Experiment. As my old friend Sumner Miller would have asked "Why is it so?". One reason we suggest, is the NASA Apollo mindset of the unimportance of fine lunar dust. These failings of the updated MSSDCA websites Version 5.0.1 are increased and aggravated because each website includes references to reports that do not apply to the subject or are invalid and exclude a NASA report that directly applies but does not mention the Dust Detector Experiment. 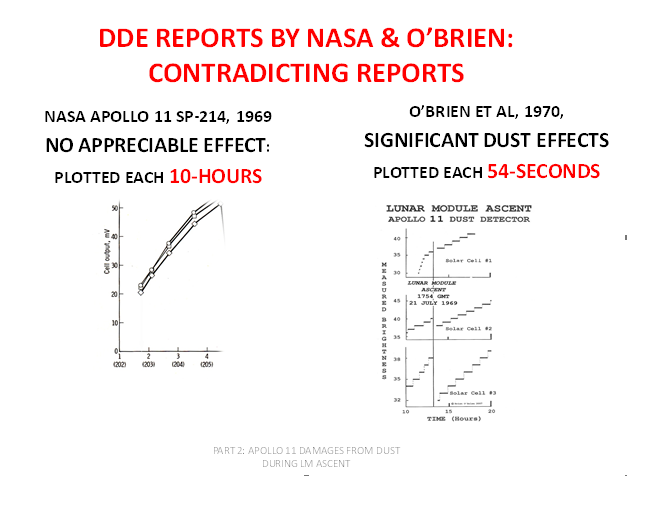 The DDE website references a NASA Apollo 11 Preliminary Science Report, NASA SP-214, whose Chapter 10 claims "no appreciable cell degradation caused by dust or debris from the LM ascent." 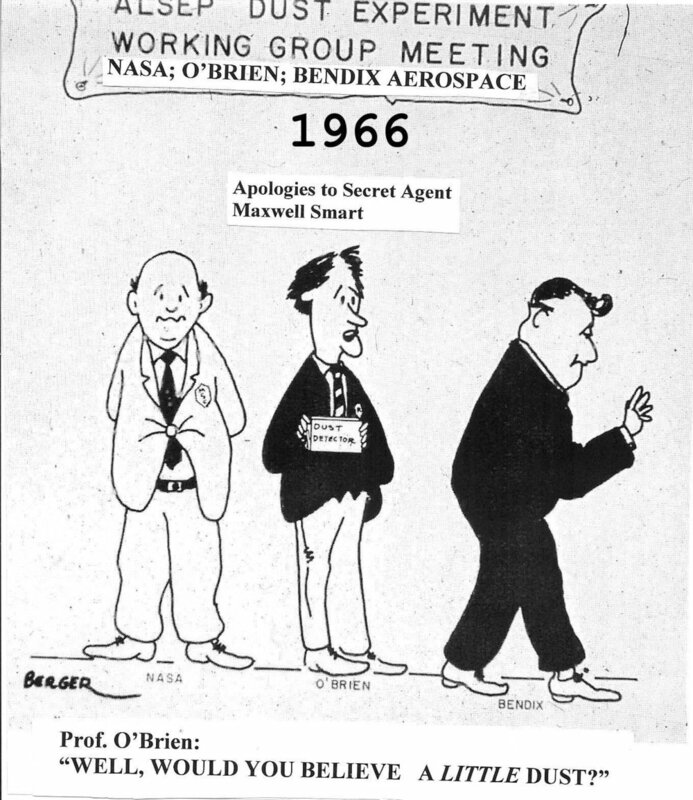 Our Website provides previously unpublished August 1969 reports by the two NASA authors of SP-214 (see The Dust Story/The Changing Truth on Dust).. O'Brien's name was included as a co-author of NASA SP-214 without his permission or knowledge for two months. Our website here was built to provide readers with facts to make their own decision. The three individuals agreed in the publication in October 1970 with O'Brien now lead author O’Brien, B.J., Freden, S.C. and Bates, J.R., 1970, “Degradation of Apollo 11 Deployed Instruments because of Lunar Module Ascent Effects”, Journal of Applied Physics, 41, pages 4538-4541. In summary each Website reflects in 2018 a common culture of the Apollo era to minimize or "dismiss" the importance of dust. (Noel Hinners, NASA Oral History, August 2010). That "dismissal" belied was valid originally when Hinners based it on the bearing strength of lunar dust as deduced from Ranger close-up photos of big rocks resting calmly on the dust surface (Hinners, 2010). By 1966 the caveat had been generally abandoned from beliefs in dismissal, and MSC was not alone in "dismissals" of our proposal for the DDE to measure dust or the actual experiment. Apollo 11 archival materials on the Web such as the Bendix briefing manual 1969) and the NASA MSC Press Kit (1969) also make no mention of the Apollo 11 Dust Detector Experiment (Google or see Publications). As a consequence, we see little point in pursuing a negative approach of criticisms item by item of each dust-related Website. Nevertheless, as the proponent for experiments magnificent astronauts deployed on the Moon, I consider at the age of 84 that I have a duty to continue attempts to have the validity of the discovered truths about lunar dust be known as transparently and fast as possible. With my beloved wife Avril passing on 20 July, 2017, Gene Cernan passing on 16 January 2017 and Alan Bean on 26 May, 2018, I feel obliged to present this website with archival and published material and memories to assist the NSSDCA webmaster to strive to have Apollo 11 EASEP and dust-related sites archive greater accuracy and consistency with measurement-based facts.. The purposes are to assist the end readers, historians, the global communities celebrating the 50th anniversary of Apollo 11, and not least future expeditions to the Moon with true and measurement-based and best-available referenced facts or working assumptions. For a time while I can be available, I hope it will be practicable to debate or otherwise assist with the Webmaster or his representative relevant notes, measurements and discoveries, to discuss and resolve uncertainties for the sake of accurate Apollo 11 history. One mandated approach is that the dust-related NSSDCA websites follow NASA obligations to make known facts available transparently. More positively during this 50th anniversary, science data relating to lunar dust, including the actions by Apollo astronauts, should be celebrated, not hidden from NSSDCA Websites. We believe the Websites rightly must be part of the Apollo 11 celebrations. All the website errors without exception err on the side of minimisation of the importance of lunar dust, and none emphasises how important it proved to be with Apollo 11. Why not? NSSDCA Websites about Apollo and dust should be filtered for error-laden effects of mindsets throughout Apollo of the unimportance of fine lunar dust. We regret that such websites cannot simply recant the vast misinformation and disinformation about fine lunar dust that contaminates present history and other websites and reports. Each clearly does not provide space science data, although all such data are published. Each makes curious mistakes in giving references which either contradict the space science data they need but have omitted, or have other defects. Each has the same culture of negativity towards the importance of dust by reporting only the fact that each was terminated. The words space science mission data require NSSDCA website to include measurements of causes of such mission performance, if causes are known and preferably measured. That was done on Apollo 11, but the Websites omit them. Such concealment amounts to shooting NASA in its foot. Indeed the EASEP updated Version 5.0.1 then shot NASA in both feet by giving on its EASEP website a reference to the Apollo 11 Preliminary Science Report SP-214 whose Chapter 10 denies significant contamination by dust or debris, which was also clearly visible to Neil Armstrong who saw the US flag blow over. Why did the website not reference O'Brien et al. (1970) which proved the dust effects? We suggest therefore such a reference which is consistent with the NSSDCA brief to present space science mission data as stated in its logo. We go further here by following what we suggested 50 years ago, on 15 August 1969 that NASA could do: take credit for foreshadowing the possibility of excessive dust on Apollo 11 and including a Dust Detector Experiment (DDE) to measure it. By this simple and valid action, the exercise with updating NSSDCA can turn from negative and uninformative hiding of published discoveries about dust, as in Version 5.0.1, to positive and transparent facts, based on published and referenced measurements, thus giving readers space science data as advertised in NSSDCA logo. From our viewpoint, it will be much more satisfying as well as correct, because such new actions of correcting relevant websites can be justified and give reasons for celebrating the success of NASA in measurements of dust and explaining the cause of the termination on the historic Apollo 11 mission. There is no disgrace for NASA or its teams in the termination of Apollo 11 EASEP provided (i) the Apollo 11 mission was equipped (however reluctantly) with an experiment to measure the (unexpected or not) cause of it, dust, and (ii) the Apollo 12 mission is then adjusted to take into account what was learned from the Apollo 11 termination. Both actions were done by NASA. Apollo 12 deployed ALSEP (the follow-up of EASEP) 130m from its landing site, compared to only 17m for Apollo 11. The Apollo 12 DDE measured the unexpected cleansing during Apollo 12 LM ascent. Science advanced further as one expects with NASA. To conclude by putting these matters into context we repeat our Progress Report to Prof. Harry Messel 15 August 1969. This 1966 cartoon visually tells the story about the the contradicting reports of the effects of the behavior of lunar dust as described in the "Ballad of Apollo 11 DDE". Said Buzz, like a kangaroo. And back to earth they popped. And the DD output dropped. ”But there is no effect” said M.S.C. The computers said as such. “Oh is it just?” said Agnew, Spiro T.
A detector of little men green. Which proved they were not real. Even by Congress, will not be bought. We’ll stay at home and be with Mother. Source: Brian J. O’Brien, 18 Sept. 1969. [Two typos corrected 25 Jan. 2010]. Distributed to: J. Clayton, Bendix; D. Reasoner, Rice; W. Hess, MSC; S. Freden, MSC TG; R. Allenby, NASA Hqtrs. ; GP. Kenney, MSC TD5; D. G. Wiseman, MSC, TD. The Apollo 11 Dust, Thermal, and Radiation Engineering Measurements Package (DTREM) was a modified Dust Detector Experiment (DDE) put on the Moon in 1969 by Buzz Aldrin as one of only two active experiments in the Early Apollo Surface Experiments Package (EASEP) to transmit measurements back to Earth. At the ascent of the Lunar Module, the output voltages of 3 solar cells, all horizontal in this modified DDE, fell by 17%, 7% and zero. O’Brien in Sydney claimed this meant a significant contamination by dust and debris. Manned Spacecraft Center personnel were at first reluctant to agree that any effects occurred.. They argued that it was “highly unlikely that the dust and debris chose [sic] to settle on only two of the three solar cells mounted side by side”. So they concluded that “no appreciable degradation” occurred. This position continued, despite appeals by O’Brien to Bendix Aerospace, NASA Headquarters are others. Finally, as part of Brian O’Brien’s increasing concern, in those days without the Internet and E-mail, with phone calls expensively rare, cables limited and Air Mail very slow, he resorted again to satire with this Ballad on 18 September 1969. It was widely circulated. Despite this, the Apollo 11 Preliminary Science Report SP-214 stated that “no appreciable degradation” occurred. It did not include the acknowledged fact that in two cells there was significant degradation. Instead, it plotted outputs of voltage at 10-hour intervals, and joined the dots with straight lines (Figs. 10-3 and 10-4, SP-214). Early in 1970, MSC agreed to co-author O’Brien’s paper about contamination on Apollo 11 LM ascent. It was peer-reviewed and published in the Journal of Applied Physics. But by then it was October 1970. That JAP paper was never referenced to BJOB’s knowledge and appeared unknown until 2009 with O’Brien’s May 2009 GRL paper. The NASA Apollo 11 Preliminary Science Report SP-214, which claims no appreciable effect, is accessible on Google. MSC was the NASA Manned Spacecraft Center in Houston. Spiro T. Agnew was Vice President and appointed head of the National Aeronautics and Space Council by President Nixon. In 1969 Agnew publicly supported a US journey to Mars, contrary to Nixon’s view that funding was unavailable.